You can listen to 'Runaways' here. Three albums down the road, not counting solo albums and the b-side album, is the career of The Killers in 2012. 'Hot fuss' definitely had its moments. With 'All the things that I've done' as my personal favourite and super song over all. 'Sam's town' was a little to American to my taste. I've never been one for the Springsteen kind of American pathos rock. 'Day & age' may have been all right for some, but not for me. Despite the fact that 'Human' just wouldn't get itself unstuck from my mind. So what about the new album, Battle born? The first thing I picked up was single 'Runaway' which sounded familiar. The most U2 like song of Battle born. Nothing new under the sun. In an interview I read that the band wanted back to its rock side and leave the synths for what they are. So I decided that the band deserved a chance. So here I am. Listening the album for the first time my impression was that it is o.k. Of course Brendan Flowers' voice determines the over all sound of the band. Nothing overly exciting, but an album that is quite pleasant to listen to, with a few songs that registered. An invitation to listen again and so I did. What I noticed is that The Killers have used the four years break to gather new influences. Battle born has several flavours and each well worked out. Ballads like 'Be still' and 'Here with me' have everything in it to make a very sticky song, but both manage to stay clear of pitfalls. The very limited electric guitar fills in 'Be still' are beautiful. It would even have been better with a different singer. Flowers has found the limits of his voice. He only just manages 'Be still'. His voice may get the same rasp Bono has by now. The harmonies are the other element that make it o.k., although they come very close to Foreigner (aargh), but also to Live at its best (yes!). Sometimes it made me think of Michael McDonald and other late seventies to mid-eighties singers like Christopher Cross. But what to think of German band Alphaville in 'Miss atomic bomb'? Not exactly what I associated with The Killers before (nor particularly liked at the time). However it works for these The Killers songs to make them more pronounced. The clinical, cold cover of Battle born couldn't be more beside the truth, I realise. This album is anything but cold. Bit of a strange choice, even if it's made well. The title track is a great song. Melody, singing, guitar playing, the bombastic sound and the harmonies are Queen light. 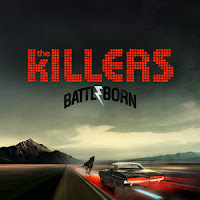 Over time 'Battle born' may even compete with 'All the things that I've done' as The Killers' best song to date. Over the whole album the band does more with harmonies then I remember before. This is definitely an asset that makes The Killers better than it was. To end an album with the beat track shows that a band is confident of what's on offer. I can end this review quite simple. Battle born is The Killers best album to date. It shows tremendous growth as songwriters, players and arrangers, but also potential. If this is possible, then what's next? Perhaps, and this is to my surprise, The Killers do have the potential to become one of my favourite bands, where so far they were somewhere in the sub top.